ABC News – Kanye West is still reeling from backlash over his controversial pro-Donald Trump rant over the weekend, but the rapper could be bracing for even more bad news, according to a report. The NBA will likely ban Kanye West’s highly anticipated Adidas basketball sneaker this season due to the shoe’s design, ESPN reported Monday. NBA officials must OK new designs from brands ahead of each season. 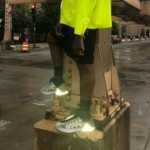 The NBA hadn’t formally reviewed the new Yeezy shoe as of Monday, but the design West showcased most recently would not be permitted as is, a source told ESPN. Versions of the sneaker without the reflective design would most likely be approved, according to the source. West showcased the shoe in a handful of Instagram posts last week, accumulating more than 2 million likes and comments, collectively. He also wore them during his appearance on “Saturday Night Live” over the weekend, when he delivered a surprise pro-Trump rant and claimed he would run for president in 2020. 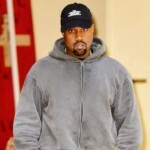 The last week has been a rough one for West: The “SNL” audience booed him as he voiced support for Trump, some fans denounced him, and he pushed back the release of his new album, “Yandhi,” by nearly a month. West faced fierce backlash over the appearance, but he also scored Trump’s praise.